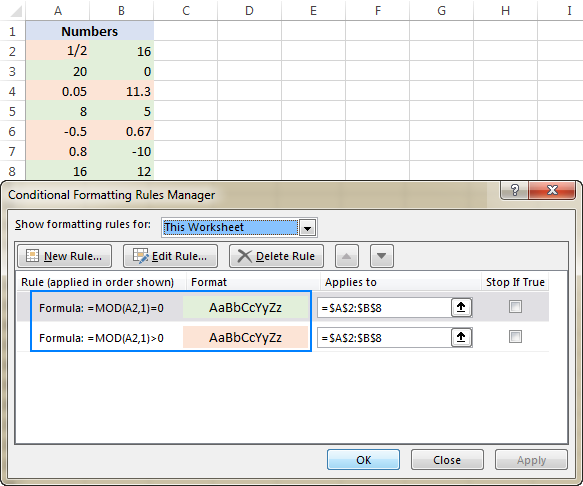 The tutorial shows how to use the MOD function to perform the modulo operation in Excel. You will also learn how finding remainder can help with solving more complex tasks such as summing every Nth cell, highlighting odd or even numbers, and more. 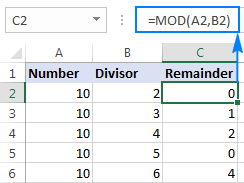 The Excel MOD function is designed to get the division remainder. Simple, isn't it? But this function is capable of much more than its original purpose, and in a moment you will learn a few non-trivial uses of MOD in Excel that may prove helpful in your work. The MOD function in Excel is used to find remainder after division of one number (dividend) by another (divisor). In mathematics, this operation is called the modulo operation or modulus, hence the name MOD. Number (required) - the number to be divided. Divisor (required) - the number to divide by. For example, MOD(10,3) returns 1 because 10 divided by 3 has a quotient of 3 and leaves a remainder of 1 (10=3*3+1). The formula MOD(10,5) returns zero because 10 is divided by 5 without remainder. The result of the MOD function has the same sign as the divisor. If the divisor is 0, MOD returns the #DIV/0! error because you cannot divide by zero. 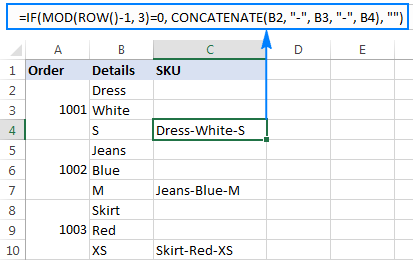 If the number or divisor is a text value, an Excel Mod formula returns the #VALUE! error. In real-life worksheets, the Excel MOD function is rarely used on its own. More often, you will find it as part of bigger formulas that perform various calculations based on division remainder. Surprising at it may seem, Microsoft Excel has no built-in function to sum every 2nd, 3rd, etc. row in a worksheet. However, that can be easily done by using one of the following formulas. To sum even rows, the result should be 0 because even numbers are divisible by 2 evenly, without remainder. To sum odd rows, the result should be 1 because odd numbers divided by 2 leave a remainder of 1. Personally, I'd stick with SUMPRODUCT because ROW is a volatile function and using it in an array formula makes the whole formula volatile. That means the formula would recalculate with every change you make to a workbook, which may noticeably slow down your Excel. Finally, SUMPRODUCT multiplies the above array and C2:C10, and then adds up the products. Since multiplying by zero always gives 0, only the rows that contain 1 in the first array survive the multiplication. In situations when the details relating to the same item are split into several cells, combining the contents of every N number of cells into one cell may be a challenge. Important note! For the formula to work correctly, it shall be entered in the 3rd row with data (C4 in this example), and then copied down the column. First, you check if a given row is divisible by 3 with no remainder: MOD(ROW()-1, 3)=0. To get the relative position of the current row, we subtract 1 from the actual row number (since our data begins in row 2, not in row 1). If the division remainder is equal to 0, the CONCATENATE function combines values from 3 cells and separates them with the delimiter of your choosing ("-" in this example). The use of relative cell references ensures that three different cells are concatenated each time. This will make your formula more flexible and it won't require further adjustments no matter in which row your data starts. As you already know, the easiest way to identify an even integer is divide the number by 2 and check for zero remainder. To identify an odd number, you check for a remainder of 1. Again, we will be using the MOD function to find remainders, and SUMPRODUCT to count the "filtered cells". 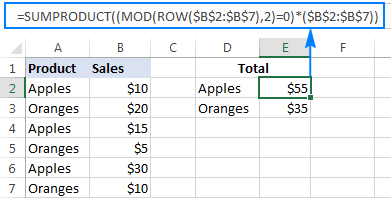 Aside from calculating cells based on a specific remainder, the MOD function in Excel can be used to highlight those cells. 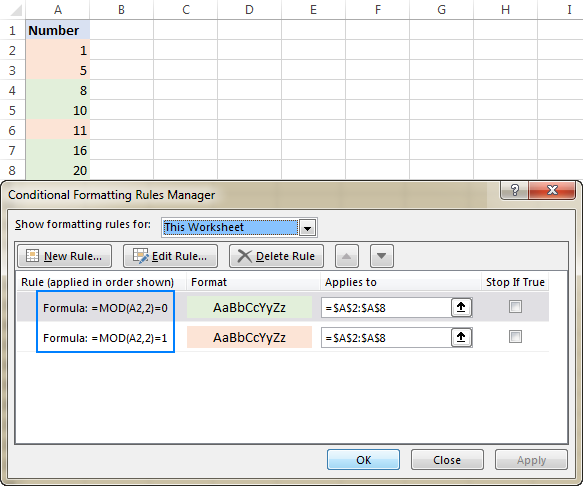 For this, you will have to create a formula-based conditional formatting rule. The detailed steps to set up a rule can be found here, and the formulas are provided below. Where A2 is the leftmost cell with data. To highlight multiples of a specific value, simply divide a number by that value and check for zero remainder. Where A3 is the top left cell in the range for which you create the rule (A3:C9 in the screenshot below). 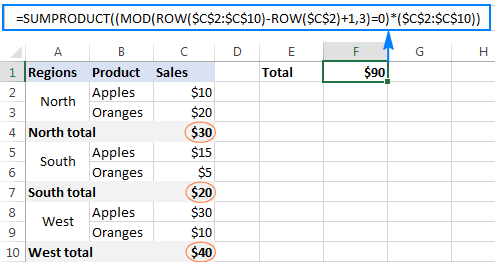 Another clever use of the Excel MOD function can be preventing entry of certain data in selected cells, such as odd numbers, even numbers, or decimals. This can be done with the same MOD formulas that we've used to highlight cells, but this time we will be defining a Data Validation rule. 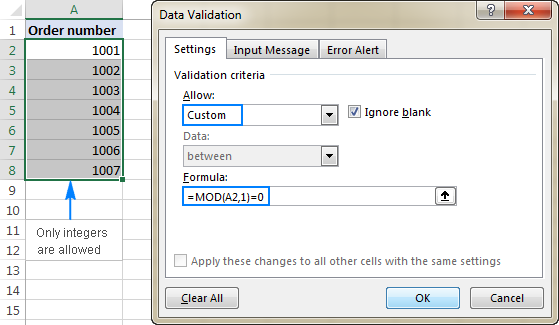 To make a data validation rule based on a formula, click Data > Data Validation. On the Settings tab, select Custom in the Allow box, and enter your formula in the Formula box. 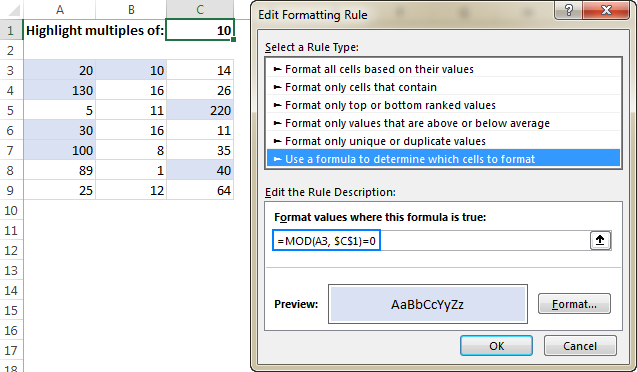 For the detailed steps, please see How to create a custom validation rule in Excel. Where A2 is the left-top-most cell of the selected range. That's how you use the MOD function in Excel to find the division remainder and perform other calculations. To have a closer look at the formulas discussed in this tutorial, you are welcome to download our sample Excel MOD workbook. For more formula examples, please check out the resources at the end of this page. I thank you for reading and hope to see you on our blog next week! Highlight every other row in Excel - how to shade odd and even rows with different colors. Shade groups of rows with different colors - how to highlight blocks of 2 or 3 rows. Alternate row colors based on change of value - a clever MOD formula to highlight rows when a cell value changes. Extract time from date and time values - how to split date and time in separate cells. One Response to "Excel MOD function to get remainder and more"
the formula Mod((sqrt(n)*180)-225,360) calculates degrees of any number on a circle starting on the horizontal left as zero going clock wise.